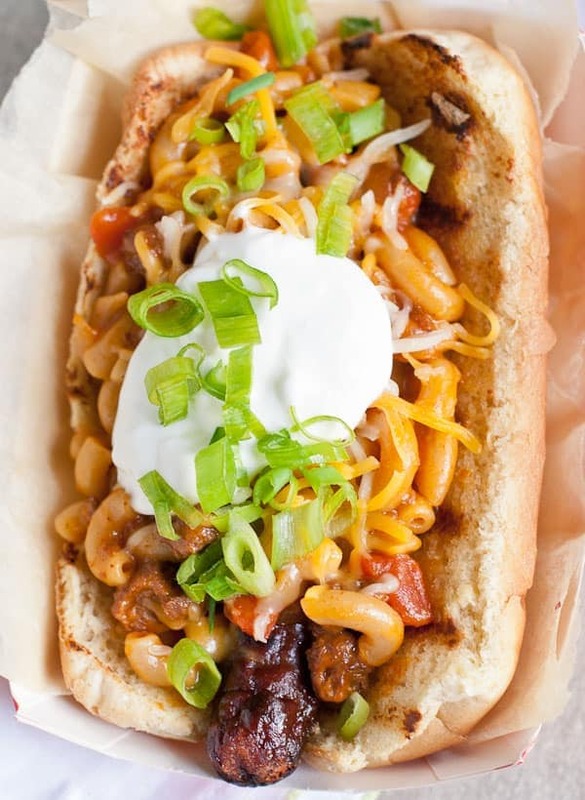 These Loaded Chili Macaroni and Cheese Hot Dogs are so ridiculously fun and delicious. They’ll make you feel like a kid again! 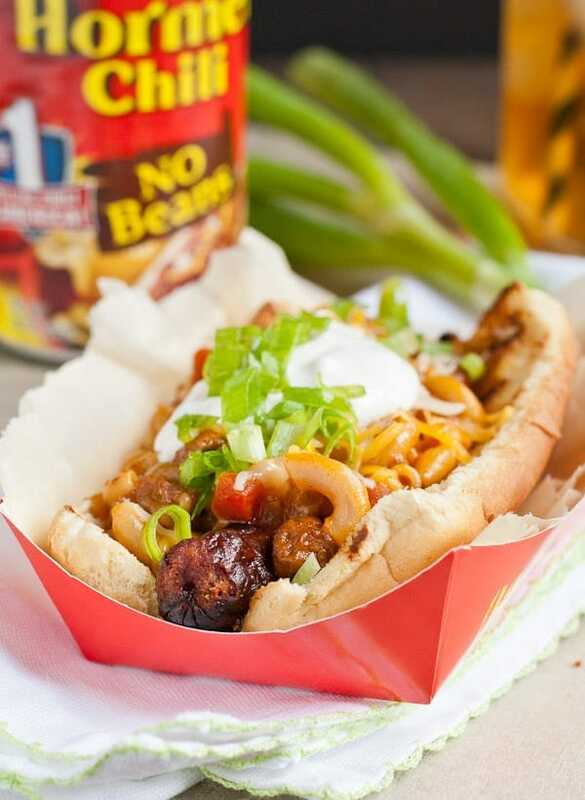 What’s the first thing that pops into your head when you think of Hormel Chili? I’m guessing for about 90% of you it’s the famous Hormel Chili dip which involves approximately 2 minutes worth of work and only 2 ingredients: A can of chili and a block of cream cheese. And maaaaybe some shredded cheese if you’re feeling extra fancy. The dip can often be spotted at tailgates and cookouts being gobbled up by the masses. It’s solid, no brainer party food. Cream Cheese Chili Dip may hold the majority of the market when it comes to chili, but there are a ton of other ways to use up that can of Hormel in your cupboard. One of my favorites is this easy, one pot Chili Macaroni and Cheese. If you have 15 minutes and a few pantry staples on hand, you have everything you need to whip up this creamy, slightly spicy, cheesy mac. 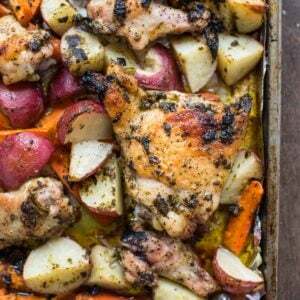 It’s ridiculously simple, comes together in a single pot on your stove top, and leaves you with a satisfying, budget friendly meal that everyone in the family will love. But why stop with chili mac? I’ve been wanting to put macaroni and cheese on a hot dog for a long while. After all, what kid didn’t love eating boxed macaroni with cut up hot dogs? 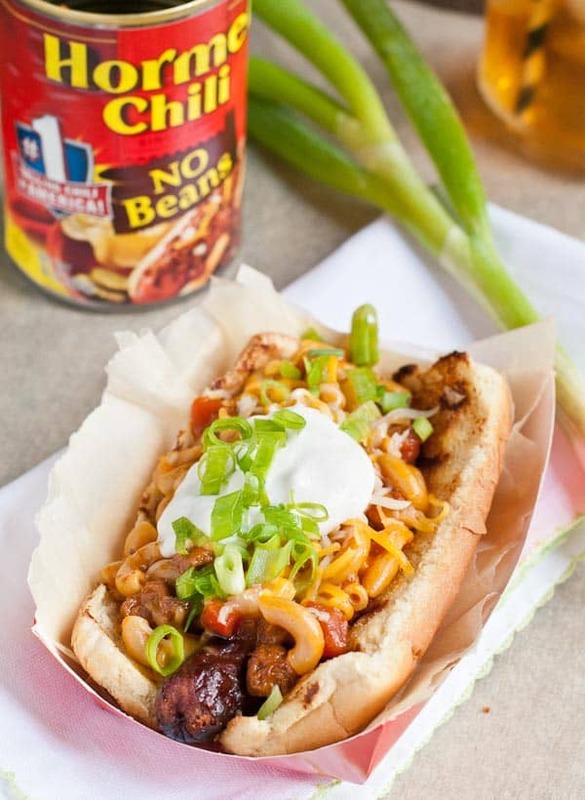 With these Loaded Chili Macaroni and Cheese Hot Dogs, you get two toppings in one. Classic, spicy, meaty chili + creamy, cheesy macaroni. It’s as over the top delicious as it sounds, and it doesn’t end there. I topped mine with a dollop of sour cream, more cheese (obviously), onions, and, for those who like a little extra heat, a few sliced jalapenos. Guys, I cannot quit with the hot dogs. The warm weather, the smell of the grill being fired up, heck, even the mosquitos are telling me it’s hot dog season. Let’s embrace it, friends. Grab a plate, more napkins than you think you’ll need, and head outdoors for some Loaded Chili Mac Hot Dogs! Hormel Foods offers a range of products for easy outdoor entertaining. 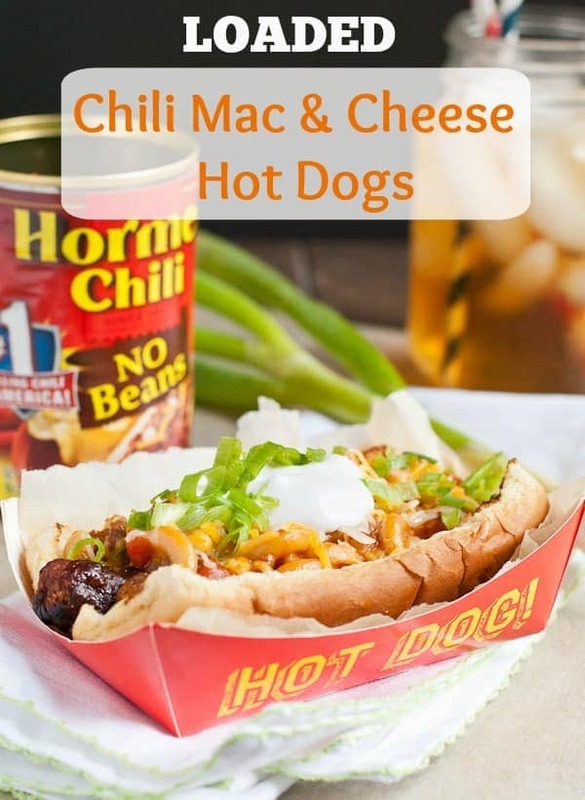 If you’re looking for more ways to use Hormel Chili, check out these Easy Recipe Ideas or sign up for the Hormel Newsletter! You can also share your own fabulous recipe ideas on Hormel’s Facebook page! In a large pot, heat the oil over medium heat. Add onion and jalapeno and saute until softened. Stir in the Hormel chili, tomatoes, chili powder, and paprika and heat through. Add the water and bring to a boil. Stir in the macaroni noodles, reduce heat to a simmer and cook for 8-10 minutes, stirring occasionally, until noodles are softened and most of the liquid is absorbed. Taste and season with salt and pepper as needed. Stir in 1 1/2 cups of the cheese until smooth. Grill the hot dogs and buns to your liking. Top each dog with a scoop of chili mac and the remaining shredded cheese. 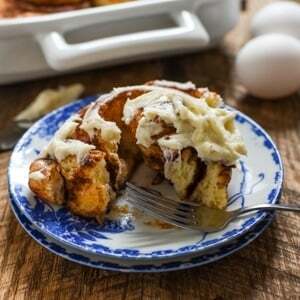 Garnish with sour cream, green onions, diced onions, or jalapeno as desired. My husband would absolutely die if I made these. They look so summery and perfect! This looks soooo good! I could make myself a vegetarian version, but my dad and husband would eat yours no problem! For some reason eating hot dogs makes me feel like a kid again…although we never ate such delicious hot dogs as this growing up! This looks amazingly delicious! These look absolutely amazing! Love all the flavors coming together! This is such a brilliant way to use chili! Though I love that classic dip recipe, I could definitely see this becoming my new favorite! It’s definitely a new favorite of ours! Oh my goodness! You combined the best of both worlds! How fun are these?! Gorgeous pictures, and I love the styling! i just want to take a big bite of this deliciousness! Thanks Cate! They were really fun to make and style!